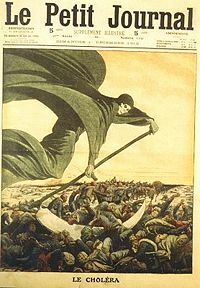 Drawing of Death bringing the cholera, in Le Petit Journal. An epidemic (from the Greek epi- ("upon") and demos ("people")) is the rapid and extensive spreading of a disease whereby there is a temporary and substantial increase in the number of cases beyond what is expected for a given population over a given period of time. An example of an epidemic would be an influenza that impacts thousands of people in a month in a nation. A pandemic is simply an epidemic that affects a large proportion of the population and spreads across a large region (for example a continent), or even worldwide. Beyond the extraordinary human suffering—such as with the bubonic plague that killed 20 million Europeans in six years (a quarter of the total population)—epidemics and pandemics have changed the course of history. The balance of power between Athens and Sparta was shifted by typhoid fever around 430 B.C.E., which killed a quarter of the Athenian troops. The Roman Empire twice lost a quarter to a third of its population in epidemics, probably first smallpox and then measles. The two epidemics weakened the Empire and advanced the spread of Christianity as pagans fell into chaos, abandoned the sick, and fled the cities, while Christians maintained networks caring for both Christian and pagan sick and survived in significantly higher ratio than pagans, many of whom converted to the apparently superior Christian faith. Old World diseases caused epidemics killing an estimated 90 to 95 percent of indigenous North American peoples, and corn found in a village abandoned due to an epidemic nurtured the founding American Pilgrims. Typhus played a major role in the destruction of Napoleon's army in 1812, in Russia. The ever-present threat of serious epidemics and pandemics remains pertinent today. In recent years, scientific and medical research and investments in public health personnel, education, and programs—all tempered with personal and social responsibility—have led to great advances in understanding the causal agents of particular infections and to developing and implementing public health policies designed to reduce or eliminate these epidemics. Defining an epidemic can be subjective, depending in part on what is "expected." An infection may be restricted to one locale (an outbreak), more general (an "epidemic"), or even global (pandemic). Because it is based on what is "expected" or thought normal, a few cases of a very rare disease like rabies may be classified as an "epidemic," while many cases of a common disease (like the common cold) would not. Epidemic differs from outbreak since the latter term refers to smaller numbers of people or a smaller locale, such as an infection involving two or more people in the same household or within a university campus or school. Endemic is the term for a common infection or disease that is constantly present within a given population or region and that occurs at a constant rate. An example of an endemic disease is malaria in some parts of Africa (for example, Liberia) in which a large portion of the population is expected to get malaria at some point in their lifetimes. The term "epidemic" also is used commonly to describe a similar phenomena in an animal population, but the more accurate scientific term is epizootic. In addition, "epidemic" also is used commonly for non-medical states to refer to widespread and growing societal problems, such as the behavioral epidemic of traffic accidents or road rage, or in discussions of obesity, mental illness, or drug addiction. There are several types of epidemics. The basic categories are point-source epidemic, common-vehicle epidemic, and vector-borne epidemic. The point-source epidemic involves a single exposure leading to a group of people falling ill, such as an agent in food that they all have consumed, for example in cases of acute food poisoning. A common-vehicle epidemic is due to an agent that is spread on an on-going basis in such vehicles as food (food-borne common-vehicle epidemic, such as spread by a foodhandler), water (waterborne epidemic such as typhoid), air (airborne common-vehicle epidemic, such as [[Legionnaire's disease), and blood (blood-borne common-vehicle epidemic, such as a blood supply infected with HIV. A vector-borne epidemic is one spread by insect or other animal vectors, including viruses such as dengue and viral encephalitis transmitted by mosquitoes. The emergence of a disease new to the population. The agent infects humans, causing serious illness. The agent spreads easily and sustainably among humans. A disease or condition is not a pandemic merely because it is widespread or kills many people; it must also be infectious. For example cancer is responsible for many deaths, but is not considered a pandemic because the disease is not infectious or contagious (although certain causes of some types of cancer might be). Phase 1: No new influenza virus subtypes have been detected in humans. Phase 2: No new influenza virus subtypes have been detected in humans, but an animal variant threatens human disease. Phase 3: Human infection(s) with a new subtype but no human-to-human spread. Phase 5: Larger cluster(s) but human-to-human spread still localized. The word epidemic comes from the Greek epi- ("upon") and demos ("people"), while pandemic comes from Greek pan (παν ) ("all") and demos(δήμος) ("people"). Peloponnesian War, 430 B.C.E. Typhoid fever killed a quarter of the Athenian troops and a quarter of the population over four years. This disease fatally weakened the dominance of Athens, but the sheer virulence of the disease prevented its wider spread; in other words, it killed off its hosts at a rate faster than they could spread it. The exact cause of the plague was unknown for many years; in January 2006, researchers from the University of Athens analyzed teeth recovered from a mass grave underneath the city, and confirmed the presence of bacteria responsible for typhoid. Antonine Plague, during the reign of Marcus Aurelius, 165–180 C.E. (also called the Plague of Galen)Possibly smallpox brought back by Roman soldiers from the Near East; killed a quarter of those infected and up to five million in all. At the height of a second outbreak (251–266) 5,000 people a day were said to be dying in Rome. Plague of Justinian, from 541 to 750, was the first recorded outbreak of the bubonic plague. It started in Egypt and reached Constantinople the following spring, killing (according to the Byzantine chronicler Procopius) 10,000 a day at its height and perhaps 40 percent of the city's inhabitants. It went on to eliminate a quarter to a half of the human population that it struck throughout the known world. The Black Death started in the 1300s. Eight hundred years after the last outbreak, the bubonic plague returned to Europe. Starting in Asia, the disease reached Mediterranean and western Europe in 1348 (possibly from Italian merchants fleeing fighting in the Crimea), and killed twenty million Europeans in six years, a quarter of the total population and up to a half in the worst-affected urban areas. First pandemic 1816–1826. Previously restricted to the Indian subcontinent, the pandemic began in Bengal, then spread across India by 1820. It extended as far as China and the Caspian Sea before receding. The second pandemic (1829–1851) reached Europe, London in 1832, Ontario, Canada, and New York in the same year, and the Pacific coast of North America by 1834. The third pandemic (1852–1860) mainly affected Russia, with over a million deaths. The fourth pandemic (1863–1875) spread mostly in Europe and Africa. In 1866, there was an outbreak in North America. In 1892, cholera contaminated the water supply of Hamburg, Germany, and caused 8,606 deaths. The seventh pandemic (1899–1923) had little effect in Europe because of advances in public health, but Russia was badly affected again. The eighth pandemic began in Indonesia in 1961, called El Tor after the strain, and reached Bangladesh in 1963, India in 1964, and the USSR in 1966. The "first" pandemic of 1510 traveled from Africa and spread across Europe (Beveridge 1977; Potter 2001). The "Asiatic Flu," 1889–1890, was first reported in May of 1889, in Bukhara, Russia. By October, it had reached Tomsk and the Caucasus. It rapidly spread west and hit North America in December 1889, South America in February–April 1890, India in February-March 1890, and Australia in March–April 1890. It was purportedly caused by the H2N8 type of flu virus and had a very high attack and mortality rate. The "Spanish flu," 1918–1919. First identified early March 1918, in United States troops training at Camp Funston, Kansas, by October 1918, it had spread to become a world-wide pandemic on all continents. Unusually deadly and virulent, it ended nearly as quickly as it began, vanishing completely within 18 months. In six months, 25 million were dead; some estimates put the total of those killed worldwide at over twice that number. An estimated 17 million died in India, 500,000 in the United States, and 200,000 in the United Kingdom. The virus was recently reconstructed by scientists at the CDC studying remains preserved by the Alaskan permafrost. They identified it as a type of H1N1 virus. The "Asian Flu," 1957–1958. An H2N2 caused about 70,000 deaths in the United States. First identified in China in late February 1957, the Asian influenza spread to the United States by June 1957. The "Hong Kong Flu," 1968–1969. An H3N2 caused about 34,000 deaths in the United States. This virus was first detected in Hong Kong, in early 1968, and spread to the United States later that year. Influenza A (H3N2) viruses still circulate today. Typhus, sometimes called "camp fever" because of its pattern of flaring up in times of strife. (It is also known as "gaol fever" and "ship fever," for its habits of spreading wildly in cramped quarters, such as jails and ships.) Emerging during the Crusades, it had its first impact in Europe in 1489 in Spain. During fighting between the Christian Spaniards and the Muslims in Granada, the Spanish lost 3,000 to war casualties and 20,000 to typhus. In 1528, the French lost 18,000 troops in Italy and lost supremacy in Italy to the Spanish. In 1542, 30,000 people died of typhus while fighting the Ottomans in the Balkans. The disease also played a major role in the destruction of Napoleon's Grande Armée in Russia in 1812. Typhus also killed numerous prisoners in the Nazi concentration camps during World War II. Effects of Colonization. Encounters between European explorers and populations in the rest of the world often introduced local epidemics of extraordinary virulence. Disease killed the entire native (Guanches) population of the Canary Islands in the sixteenth century. Half the native population of Hispaniola in 1518, was killed by smallpox. Smallpox also ravaged Mexico in the 1520s, killing 150,000 in Tenochtitlán alone (including the emperor), and Peru in the 1530s, aiding the European conquerors. Measles killed a further two million Mexican natives in the 1600s. Some believe that the death of 90 to 95 percent of the Native American population of the New World was caused by Old World diseases. As late as 1848–1849, as many as 40,000 out of 150,000 Hawaiians are estimated to have died of measles, whooping cough, and influenza. There are also a number of unknown diseases that were extremely serious but have now vanished, so the etiology of these diseases cannot be established. The cause of English Sweat in sixteenth century England, which struck people down in an instant, and was more greatly feared even than the bubonic plague, is still unknown. Lassa fever, Rift Valley fever, Marburg virus, Ebola virus, and Bolivian hemorrhagic fever are highly contagious and deadly diseases with the theoretical potential to become pandemics. Their ability to spread efficiently enough to cause a pandemic is limited, however, as transmission of these viruses requires close contact with the infected vector. Furthermore, the short time between a vector becoming infectious and the onset of symptoms allows medical professionals to quickly quarantine vectors and prevent them from carrying the pathogen elsewhere. Genetic mutations could occur that might elevate their potential for causing widespread harm, thus close observation by contagious disease specialists is merited. Antibiotic-resistant "superbugs" may also revive diseases previously regarded as "conquered." Cases of tuberculosis resistant to all traditionally effective treatments have emerged to the great concern of health professionals. Such common bacteria as Staphylococcus aureus, Serratia marcescens, and species of Enterococcus that have developed resistance to the strongest available antibiotics, such as vancomycin, emerged in the past 20 years as an important cause of hospital-acquired (nosocomial) infections, and are now colonizing and causing disease in the general population. In the United States, two million people per year are diagnosed with catching hospital-acquired infections after having been admitted to hospitals to receive medical care for unrelated reasons. The latest number of infections are startling, equating to four new cases per minute (2006). Of those, 90,000+ people die. Organizations like the Center for Disease Control and the World Health Organization (WHO) are leading the effort to eradicate these avoidable, yet deadly infections. HIV—the virus traced to the disease AIDS—is now considered a global pandemic with infection rates as high as 25 percent in southern and eastern Africa. Effective education about safer sexual practices and bloodborne infection precautions training have helped to slow down infection rates in several African countries, including Angola, sponsoring national education programs. Infection rates are rising again in Asia and the Americas. In 2003, there were concerns that SARS, a new, highly contagious form of atypical pneumonia caused by a coronavirus dubbed SARS-CoV, might become pandemic. Rapid action by national and international health authorities such as the World Health Organization helped slow transmission and eventually broke the chain of transmission, ending the localized epidemics before they could become a pandemic. The disease has not been eradicated, however, and could re-emerge unexpectedly, warranting monitoring and case reporting of suspicious cases of atypical pneumonia. From October 2004 to February 2005, some 3,700 test kits of the 1957 Asian Flu virus were accidentally spread around the world from a lab in the United States. These flu testing kits were to be used to help pathology laboratories improve their accuracy by sending them unidentified samples of various bacteria and viruses, but the 1957 pandemic strain was sent rather than something such as a strain of the various influenza A viruses. In May 2005, concern about the possibility of avian influenza led scientists to urgently call nations to prepare for a global influenza pandemic that could strike as much as 20 percent of the world's population. In October 2005, cases of the avian flu (the deadly strain H5N1) were identified in Turkey. EU Health Commissioner Markos Kyprianou said: "We have received now confirmation that the virus found in Turkey is an avian flu H5N1 virus. There is a direct relationship with viruses found in Russia, Mongolia, and China." Cases of bird flu were also identified shortly thereafter in Romania, and then Greece. Possible cases of the virus have also been found in Croatia, Bulgaria and in the United Kingdom. However, by the end of October, only 67 people had died as a result of H5N1, which was atypical of previous influenza pandemics. Despite sensational media reporting, avian flu cannot yet be categorized as a "pandemic" because the virus cannot yet cause sustained and efficient human-to-human transmission. Cases so far are recognized to have been transmitted from bird to human, but as of December 2006, there have been very few (if any) cases of proven human-to-human transmission. Regular influenza viruses establish infection by attaching to receptors in the throat and lungs, but the avian influenza virus can only attach to receptors located deep in the lungs of humans, requiring close, prolonged contact with infected patients and thus limiting person-to-person transmission. The current WHO phase of pandemic alert is level 3, described as "no or very limited human-to-human transmission." ↑ R.J. and M.L. Littman, "Galen and the Antonine Plague," American Journal of Philology 94 (1973) 254-255. ↑ John M. Barry. The Great Influenza: The Epic Story of the Greatest Plague in History. (Viking Penguin, 2004). ISBN 0670894737. ↑ D. MacKenzie, 2005. Pandemic-causing "Asian flu" accidentally released. New Scientist, April 13, 2005. Retrieved October 8, 2007. British Broadcasting Corporation (BBC). 2005. Bird flu is confirmed in Greece. October 17, 2005. Retrieved October 8, 2007. Biello, D. 2006. Ancient Athenian plague proves to be typhoid. Science News, January 25, 2006. Retrieved October 8, 2007. MacKenzie, D. 2005. Pandemic-causing "Asian flu" accidentally released. New Scientist, April 13, 2005. Retrieved October 8, 2007. Potter, C. W. 2001. A history of influenza. Journal of Applied Microbiology 91(4): 572-579. Retrieved October 20, 2006. This page was last modified on 21 August 2017, at 15:52.